Not a lot of greenery left by now, as the clearing away continues. November was a mixed month, weather-wise. A soggy start gave way to a dry, cold, bright last couple of weeks; perfect for all those cutting back and clearing up jobs that are so necessary at this time of year. 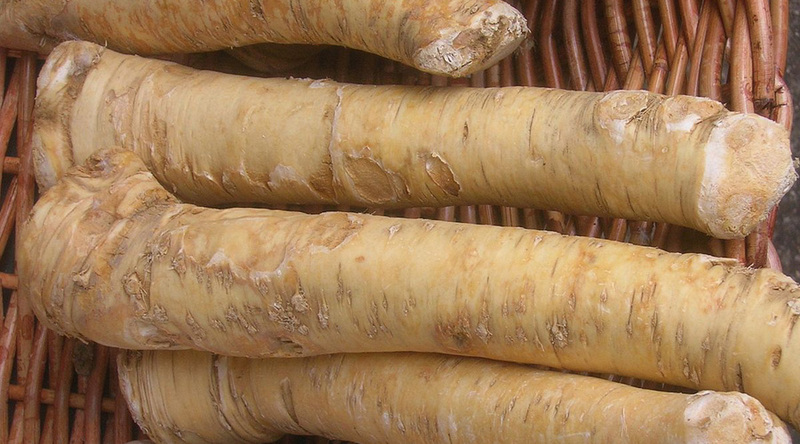 We’re well into our late Autumn veg now, with cabbages, kale, turnips, swede, leeks, giant black radishes, the last of the manky carrots and a few other roots about all that’s left in the ground. It’s all extremely welcome and means that, alongside our cured squashes, dried beans and stored garlic, we’re never short of veggies for the sort of stews and casseroles that we’re eating a couple of times a week. Never going to win any beauty contests, are they? 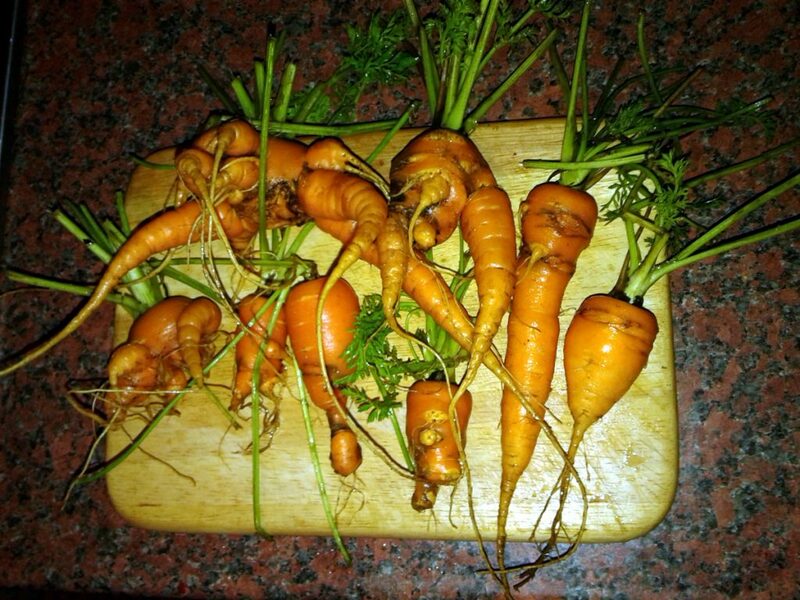 But tasty enough once they’re cleaned up a bit. Next year we’ll be making sure that there are even more winter crops available, with a bit of better planning and succession-sowing. All being well. 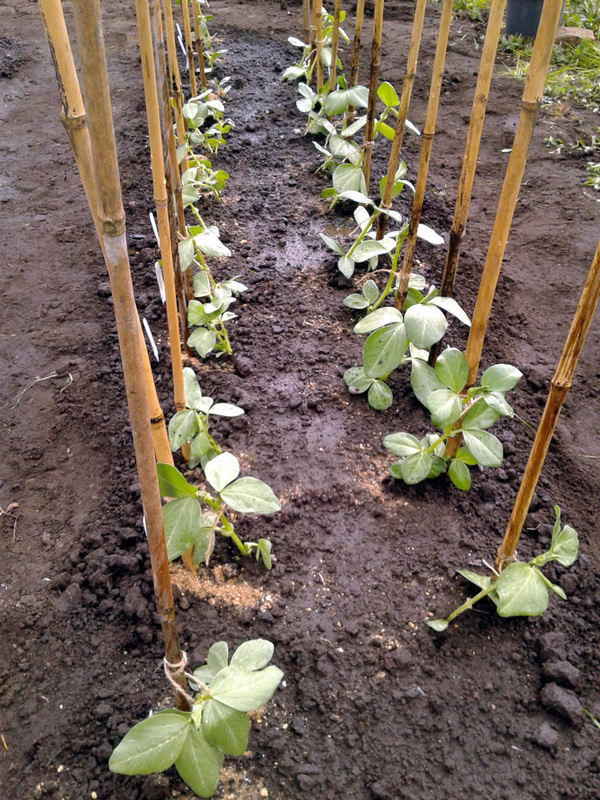 It might seem odd to be putting crops in the ground at this time of year, but we took advantage of the warm gap between the rainy week and the freezing week to get a crop of greenhouse-raised (and hardened-off) Vicia faba (broad bean) ‘aquadulce’ planted out under fleece tunnels. 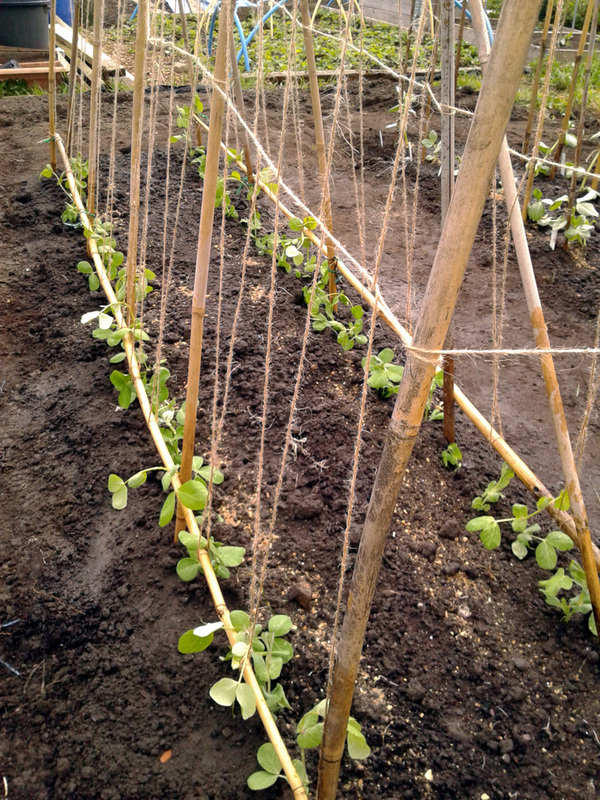 Two rows of nine; should make for a decent harvest in late May / early June. 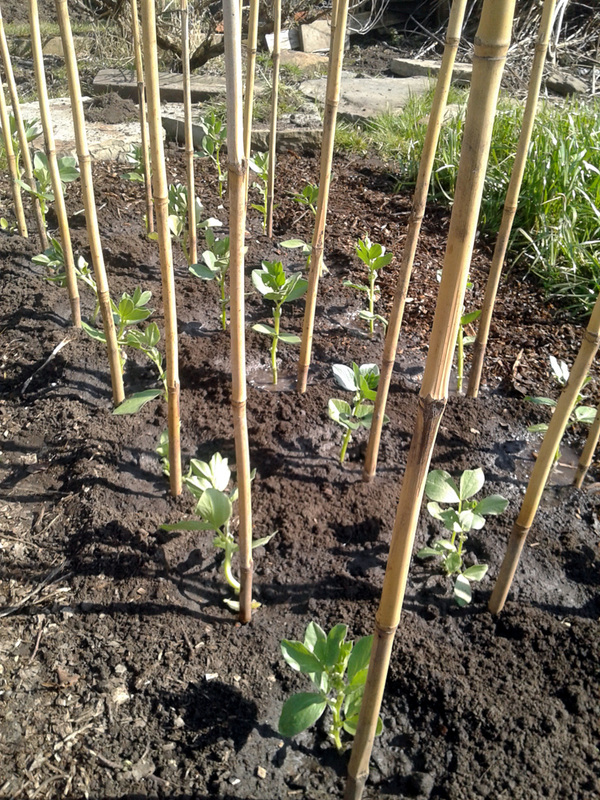 I’ve not over-wintered broad beans before now, but I saw some on another plot that were around six feet tall and cropping prolifically in late Spring, so I’m hoping for similar results. I’ve been a man on a mulching mission the past couple of weeks. 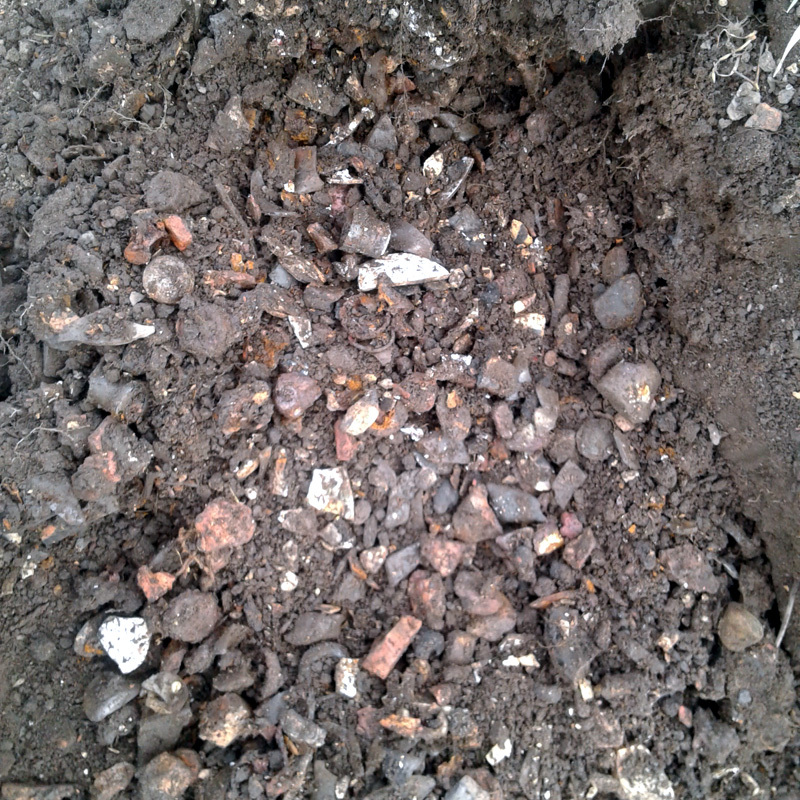 Having missed the mid-November window to get the asparagus section weeded, cleaned and covered, I went at it with a will as soon as the heaviest frosts had passed (hopefully not damaging the precious asparagus crowns too much). 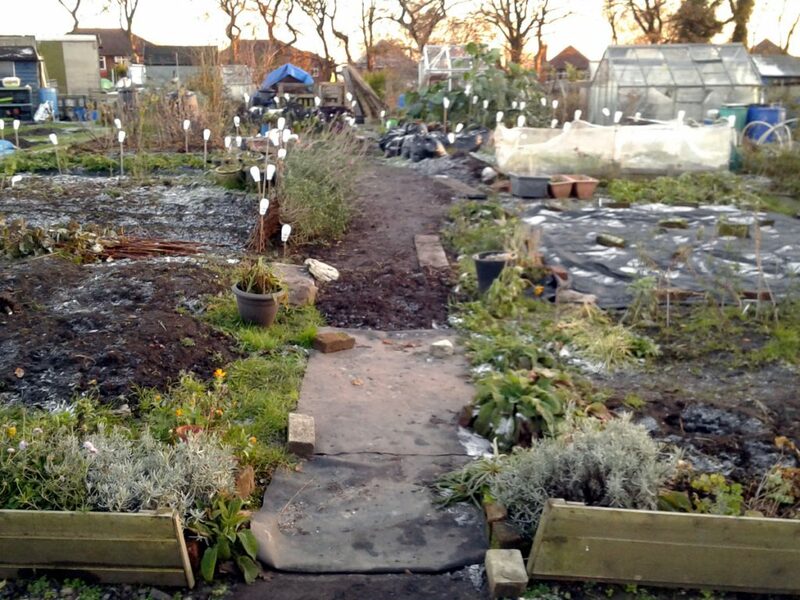 All three rows have now been cut back, cleaned up – a lot of annual weed and moss had moved in, as the section became shaded out by a row of sunflowers – and liberally mulched over. 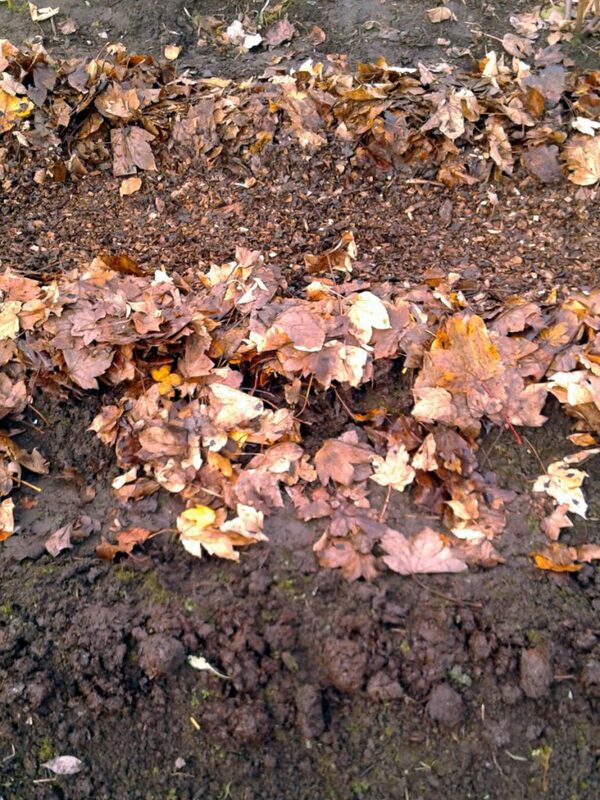 Leaves for the crowns, woodchip for the walking-on-areas. I did the research before I began and various methods were generally recommended. 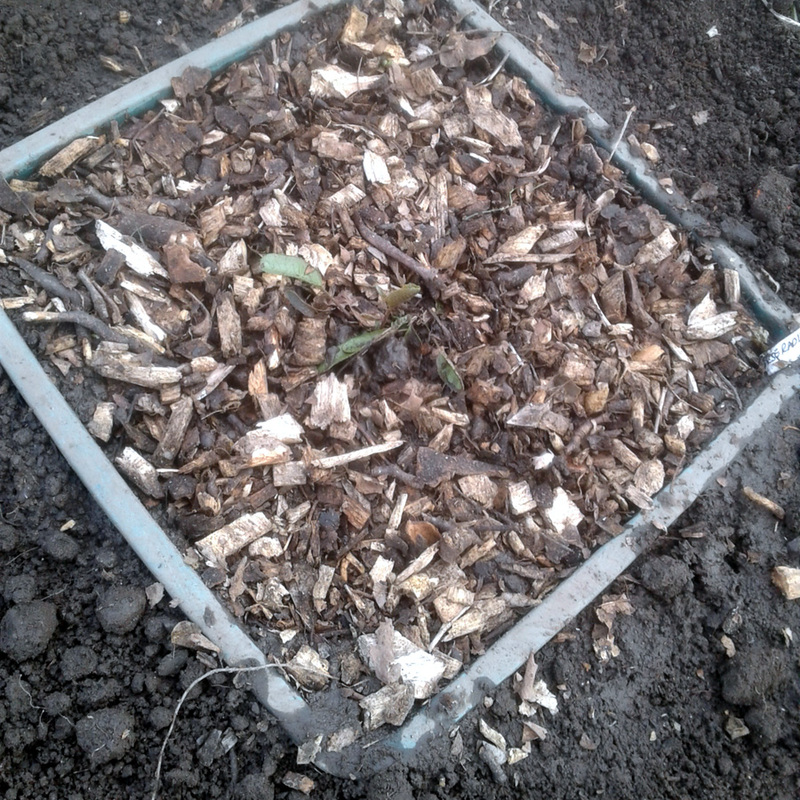 Bob Flowerdew suggests using sand, but I didn’t have anywhere near enough, so went with what was available: a thick covering of leaves for the planting rows themselves, and a good couple of inches of chipped wood on the paths in-between. 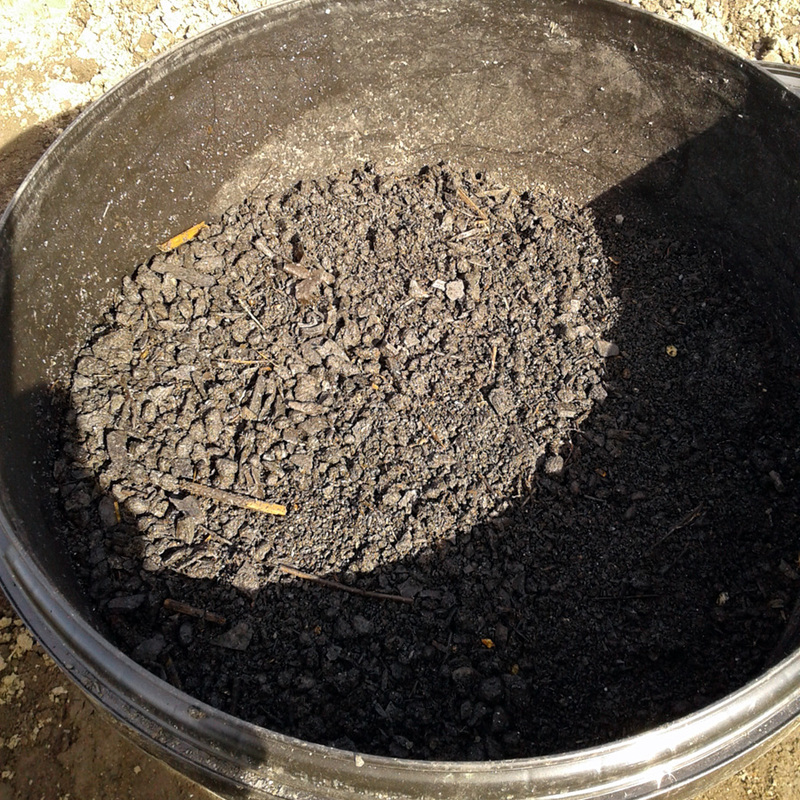 Asparagus roots are said to reach around 12′ deep, so I don’t think there should be too many concerns with nitrogen depletion as the woodchips decompose. But I’ll keep an eye on the strength of the spears when they re-grow in the Spring and feed if necessary. 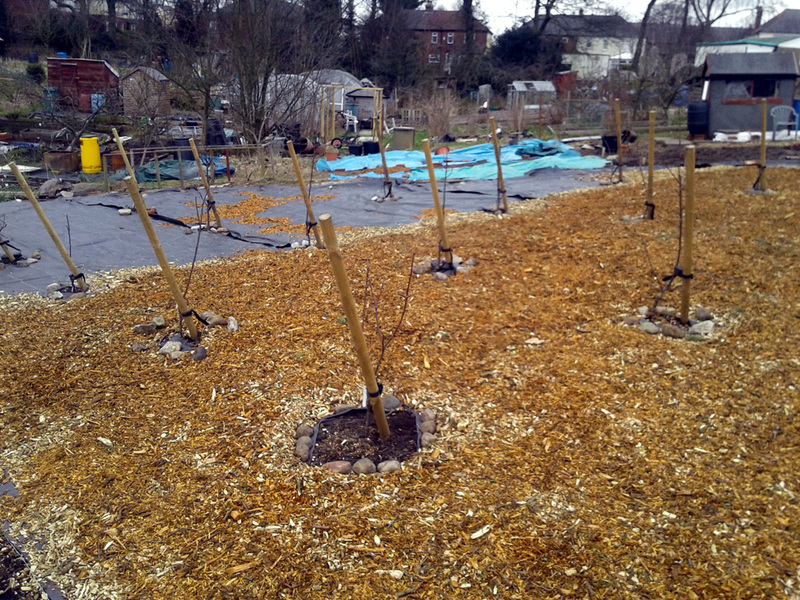 Blackcurrants, gooseberries and redcurrant bushes, spaced out, freshly mulched and ready for winter. 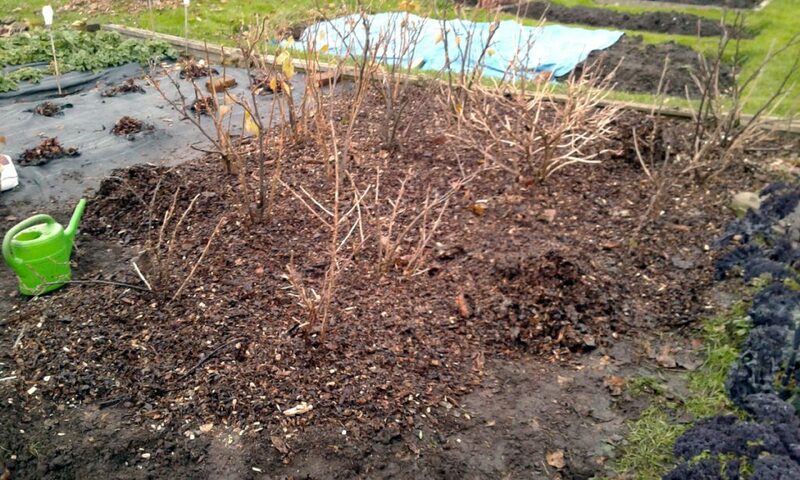 I also took the opportunity to re-space the bushes, which had become rather over-crowded since we first planted them out a couple of years ago. 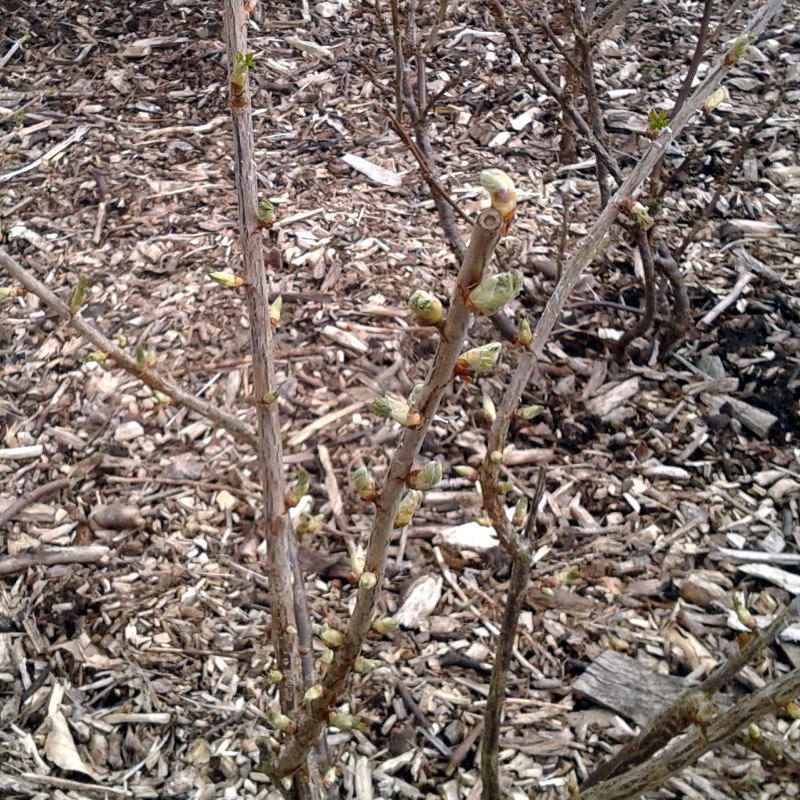 A couple of gooseberries were moved and re-planted, and three blackcurrants likewise. The result will hopefully be a lot more space for the plants to grow, and for us to get in amongst them and pick their berries come harvest-time next year. The mulch will hopefully keep the surface weeds down a bit better as well. A couple of Erysimum (wallflower) ‘Bowles’s Mauve continue to defiantly bloom, and probably will do all winter, but those aside there’s very little colour on the plot at the moment. Even last month’s Tagetes, Rudbeckia and Verbena bonarienses have given up the ghost and gone over. Never mind, they’ll be back next year, in a joyful riot of colour. That’s it for this month. We’ll continue to work the plot as much as we can, weather allowing – we were down there at the weekend, and the soil was the perfect consistency for weeding out the Ranunculus repens (creeping buttercup) that had invaded the cut-back kale patch – and when it’s inclement, sit inside with a mug of something warming and make our plans for 2017. 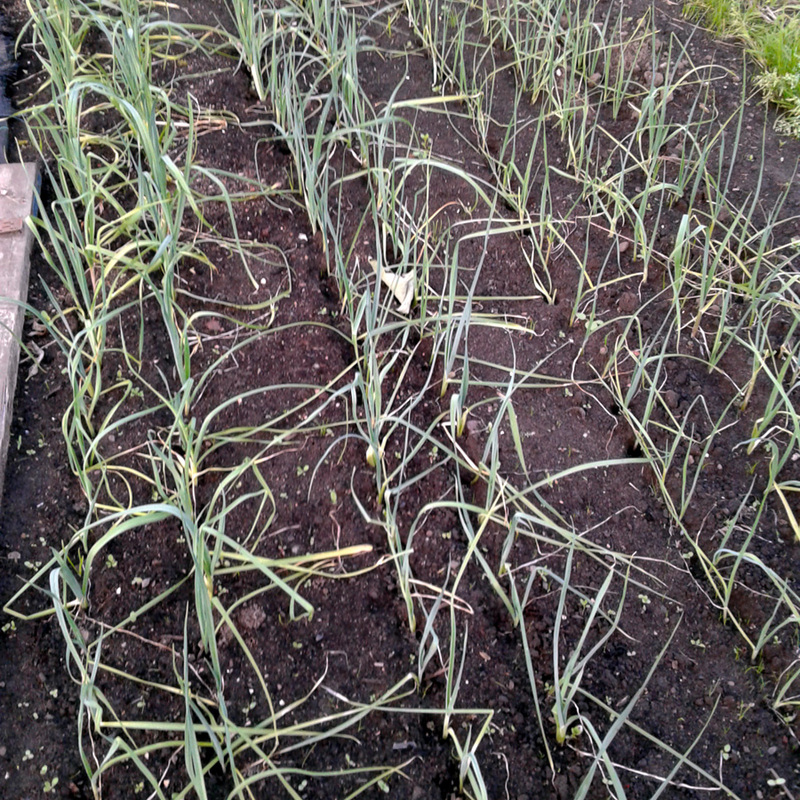 A few rows of – hopefully – lovely leeks. Grow, my beauties, grow! It’s been a funny old year. 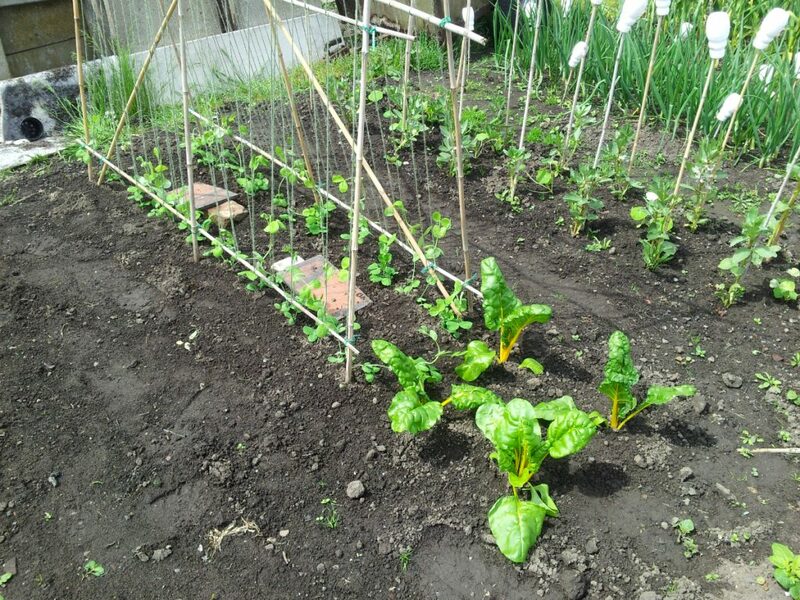 The weather in May and June was so atrocious -preventing any serious attempt at weed clearing and/or cultivating down at Plot #59 – it threw all my planting and sowing plans out of whack. Which is why I only just got round to planting out this year’s leeks a fortnight ago. 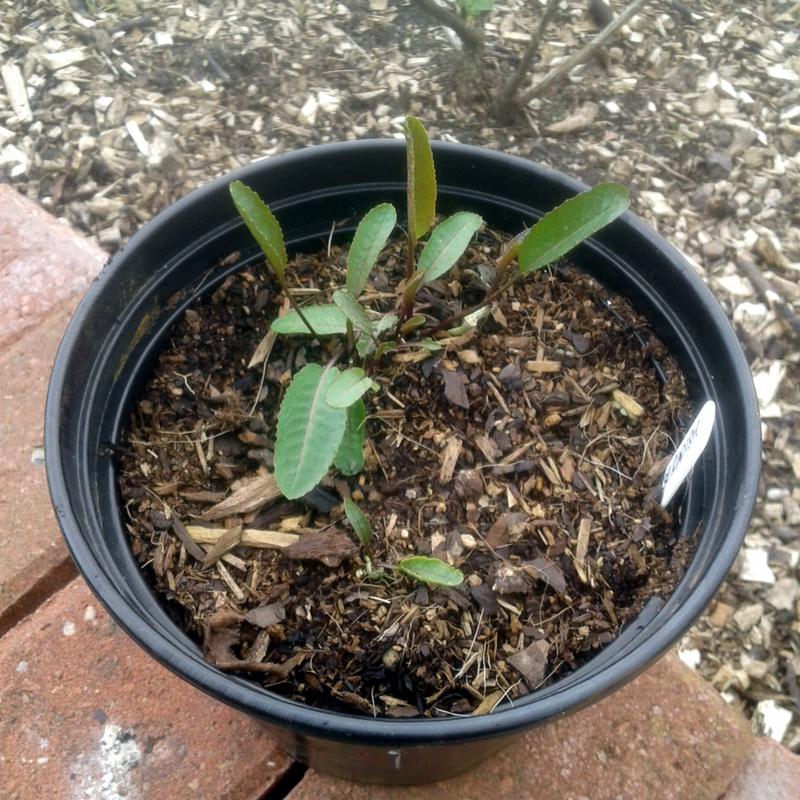 I tried a different growing method this year. In the past I’ve sown into seed trays, then potted up individual seedlings into larger pots, before planting those out in the summer. 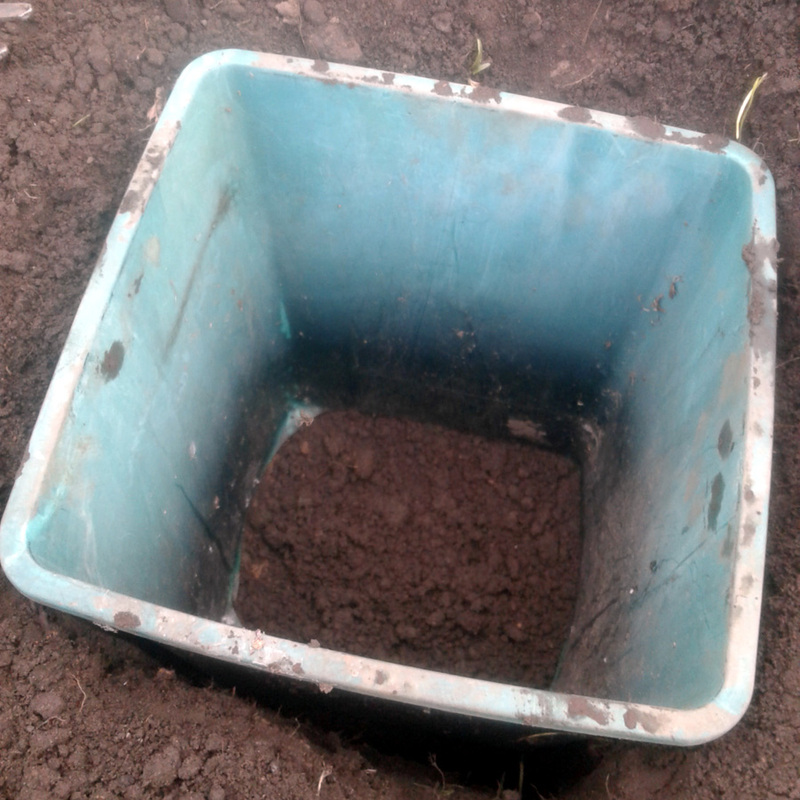 This year, I sowed straight into 8″ deep troughs, thinned the seedlings a couple of times (which meant leek thinnings for pasta sauces and soups: bonus) and then the plan was to plant them out in June, when the seedlings reached approximately pencil-thickness. 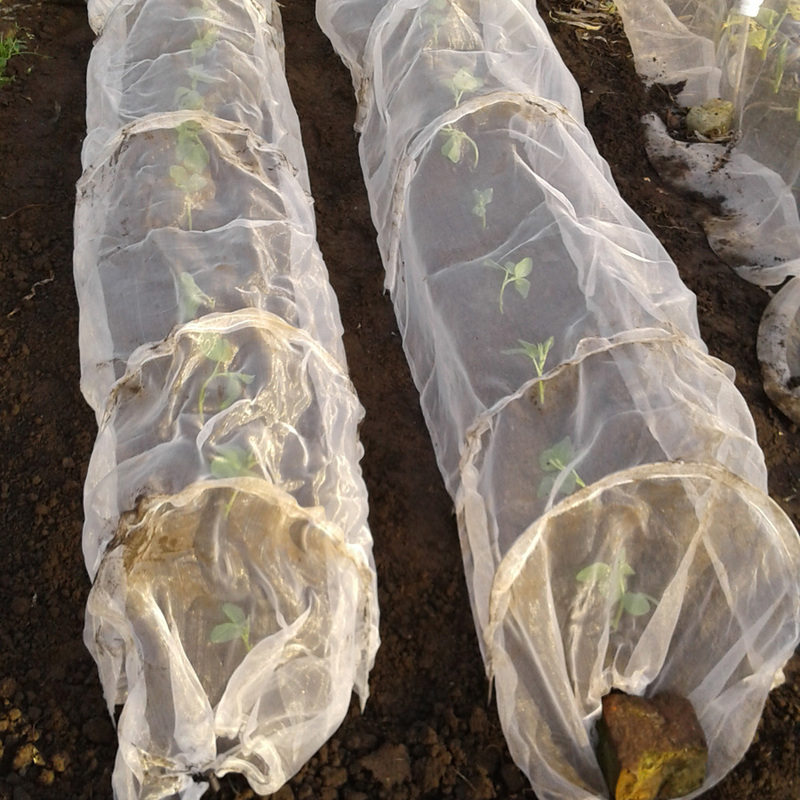 Instead, they haven’t gone into the ground until mid-August (planting out the cabbages was even more urgent) at slightly below ideal size (too long in the troughs). Dib, drop. dib, drop, dib, drop… water in well and leave ’em to their own devices. 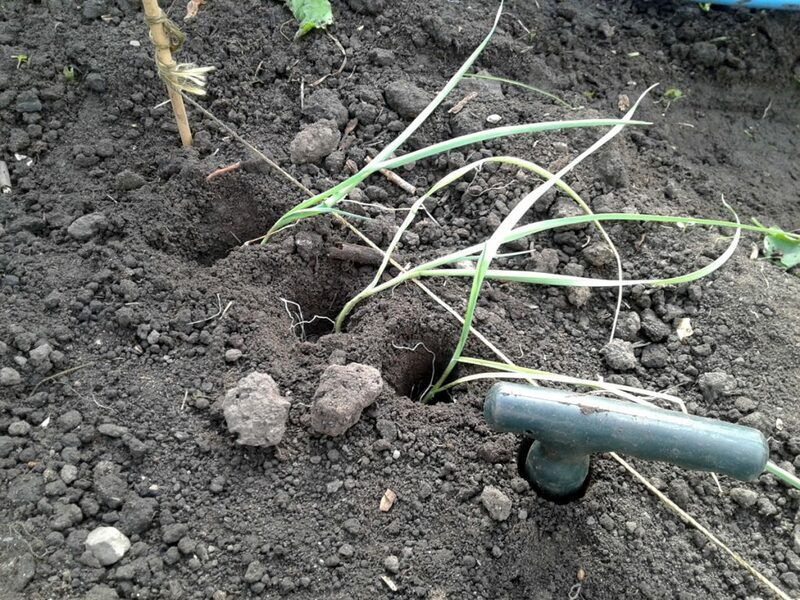 The usual method: separate the plants, mark a line with string, dib a deep hole, drop the leek in, water in to back-fill, repeat. About 280 times, as it turned out, and that was after I’d discarded anything too small or twisty to be worth bothering with. I’ve planted them quite close; the plan is to thin out every other as a baby leek (and there’s to be the odd failed or damaged specimen) then leave the rest to grow on to full size. Three varieties: ‘Herfstuezen 3 – Porvite’, ‘Elefant’ and ‘Walton Mammoth’, the latter one of my Heritage Seed Library picks this year. I’m very happy to report that a couple of weeks later, after a few days of sunshine and a few of rain, they seem to be doing fine. 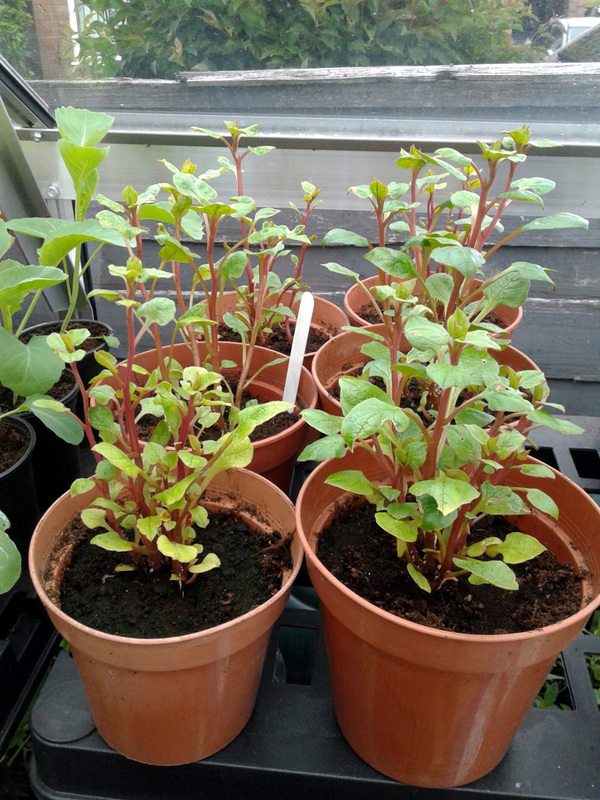 Here’s hoping they can put on enough growth between now and the end of Autumn to be hardy enough to survive whatever the winter throws at them, and thicken up nicely in the Spring. Fairly close planting, as we’re not looking for monster-sized heads. 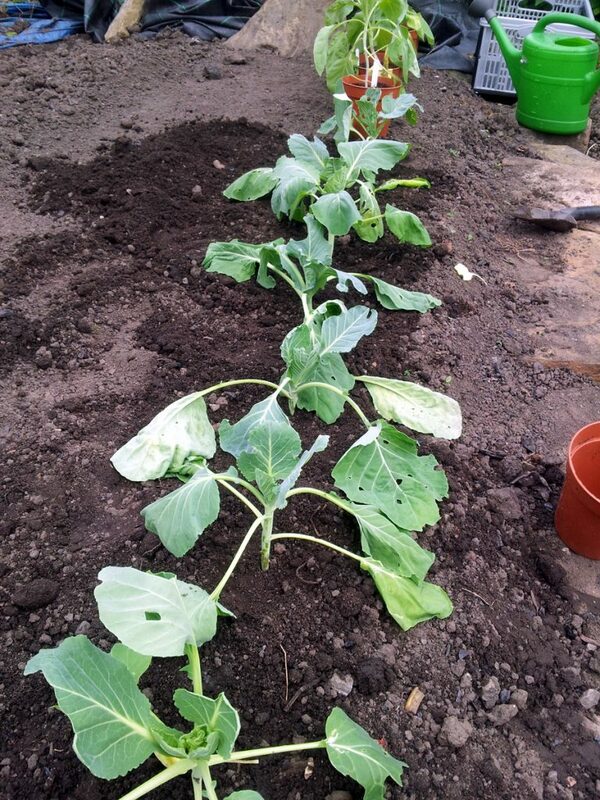 A couple of seasons back, on Beechgrove Garden, presenter Jim ran an experiment to see how the spacing of cabbage plants affected their size. He concluded that you could plant them fairly close together, as long as what you wanted were smallish heads of cabbage suitable for a couple of portions, rather than a football-sized mega-cabbage that could feed a family of six for a week. 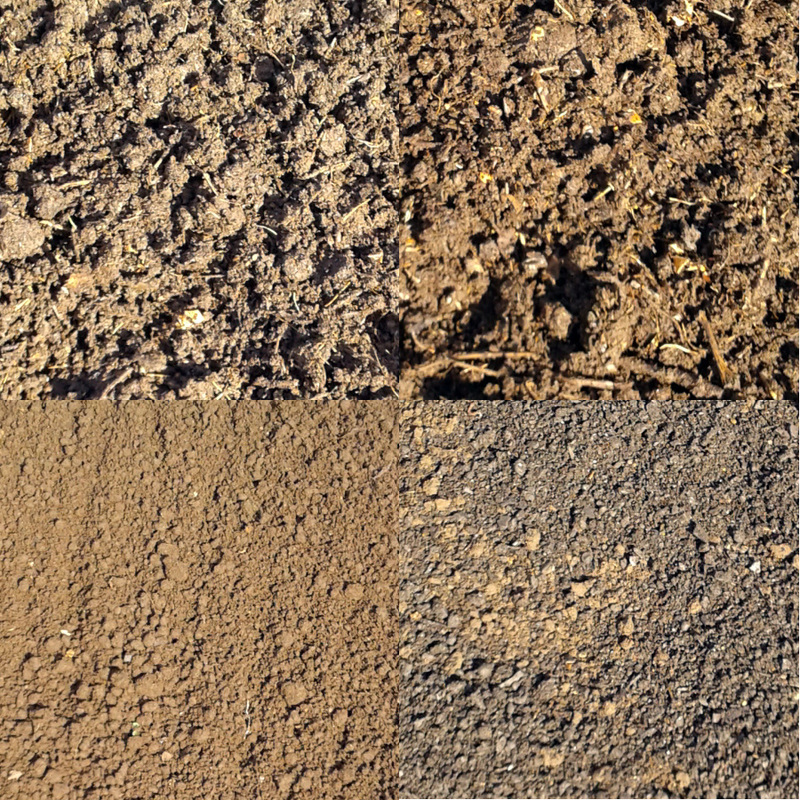 As we’re planting four different hispi / sweetheart (pointy) cabbages – ‘Jersey Wakefield’, ‘golden acre’, ‘red cap F1’ and ‘greyhound’ – they’ve been spaces at around 6-8 inches, which will hopefully keep them nice and compact. Netting is essential to keep the ravenous pigeons at bay. 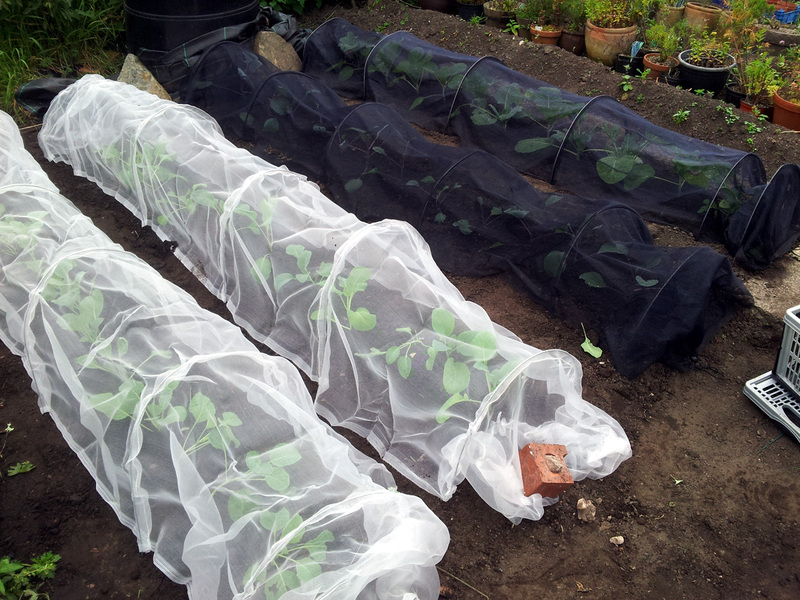 Some sort of netting protection is an absolute must: pigeon attacks are inevitable, so you have to keep the beggars at bay, and it’s always a good idea to at least try to keep the cabbage whites and diamondback moths off your crop if you can. We’ve got a batch of ‘Siberia F1’ Autumn-harvesting cabbage plants to go in at some point, and I’ll be making a late sowing of ‘January King 3’ before too long, as well. That should keep us in fresh greens for a while, all being well. 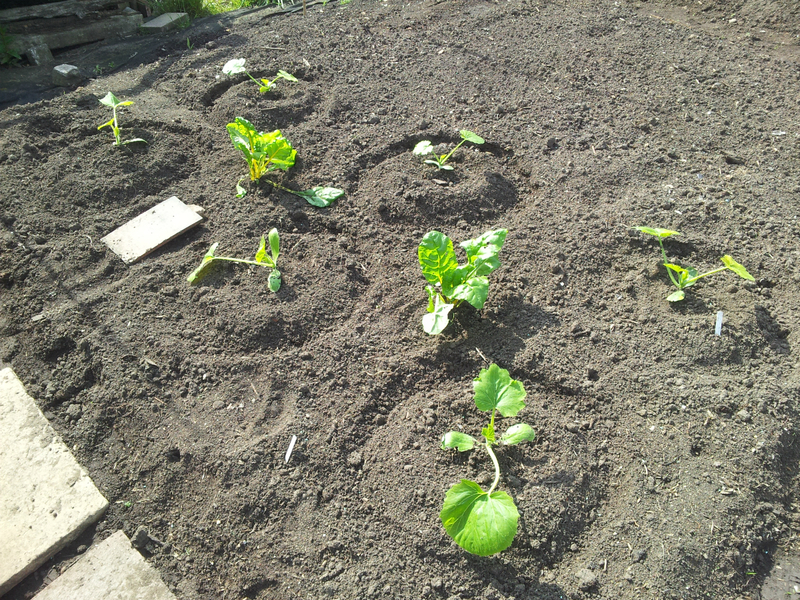 We’re growing our courgette plants at the far end of the plot this year. 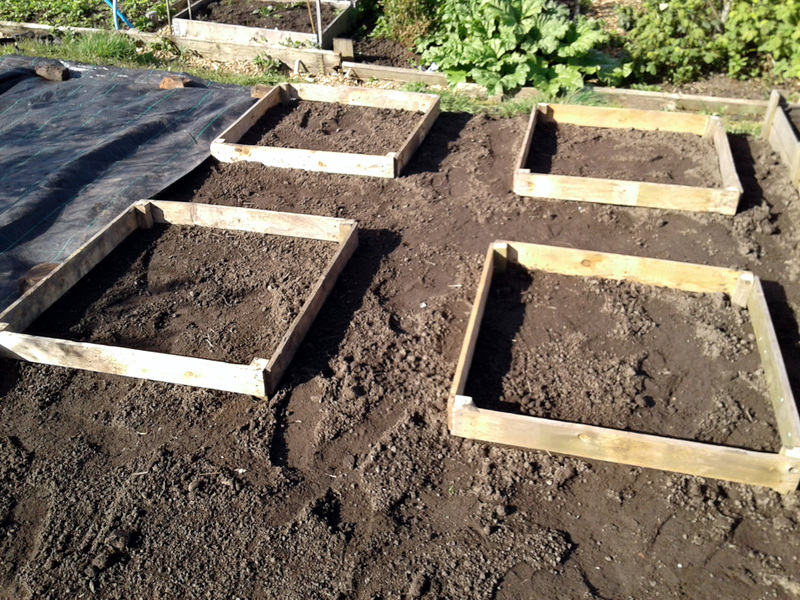 A dozen plants will be going in eventually, the first to be ready are three each of ‘Soleil F1’ and firm favourite ‘Tondo di Piacenza’, which I’ve planted motte-and-bailey style, on small mounds surrounded by a water-catching reservoir. 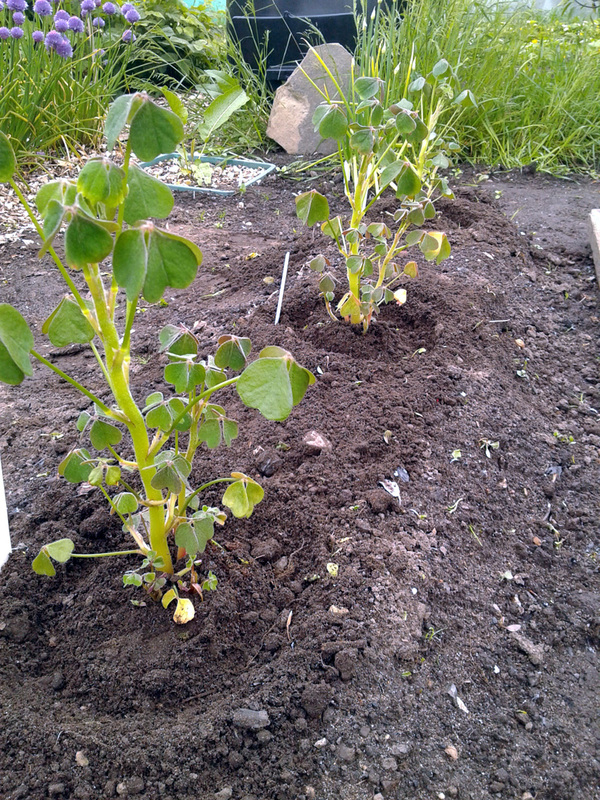 A couple more Swiss Chard have been planted as well; they should look good growing up through the courgette plants. Assuming the slugs don’t get ’em first, that is. We’ve put in a beer trap and scattered organic pellets to hopefully deal with them. That’s half of this year’s plants in. I also found time to prep this year’s three sisters patch. If you’re not familiar with the term, it’s a companion-planting scheme of Native American origin, involving beans, sweetcorn and squash. 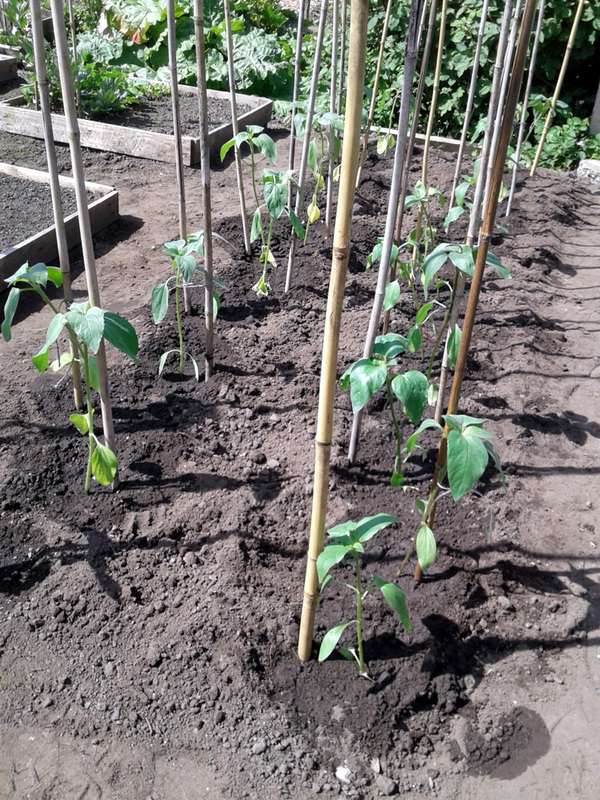 The corn provides a climbing frame for the beans to scramble up whilst the squash foliage shades the ground and keeps weeds at bay. That’s in theory, anyhow. 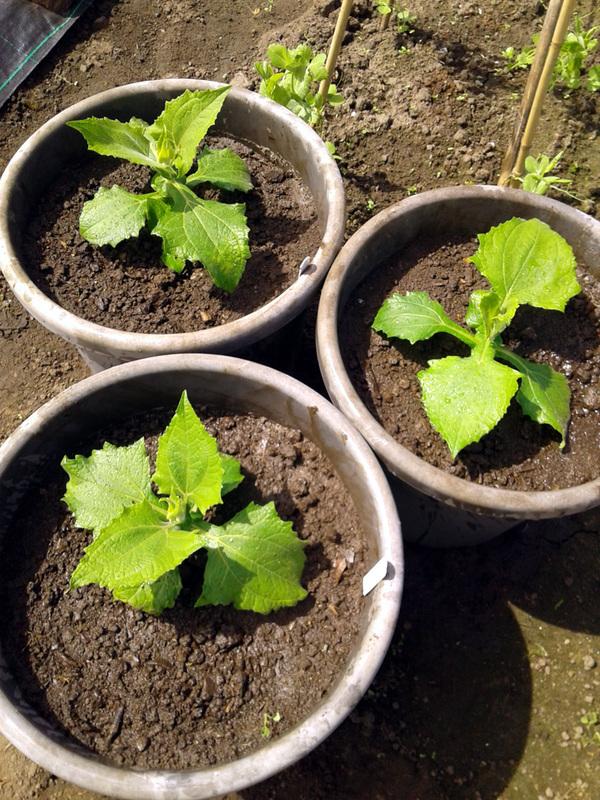 Didn’t work too well last year – the squash foliage went berserk and the dwarf beans I planted were swamped, although the sweetcorn did rather well – but hopefully this year it’ll have better results. 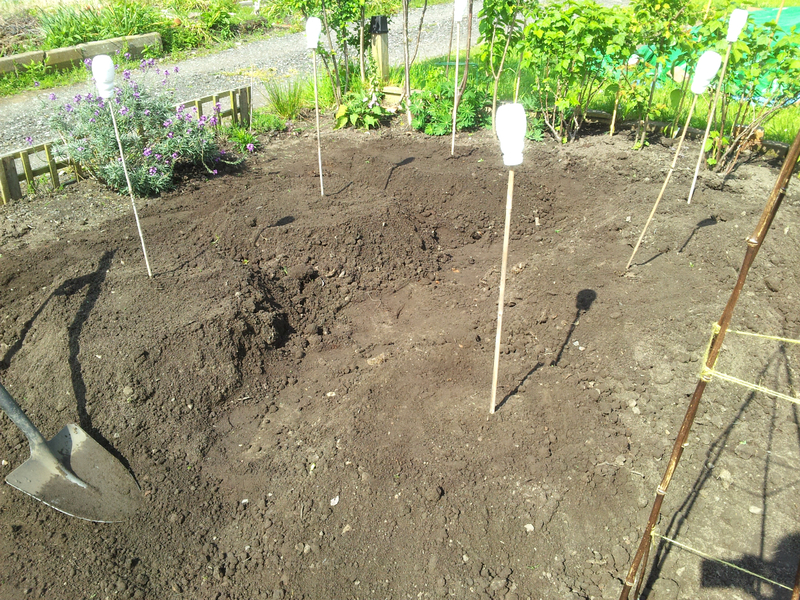 Not much to see so far, just six large and well-manured mounds of soil, awaiting planting at the weekend, time and weather allowing. Bare and bleak for now, but a riot of colour later in the year, all being well. 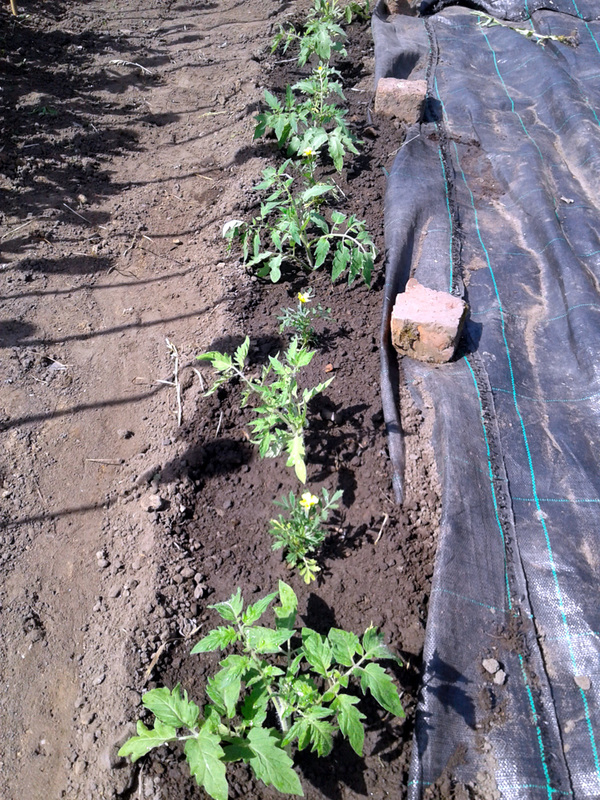 Oh, and I weeded between the potato ridges. Actual progress, coming along nicely.